CONGRATULATIONS TO THE TEAM FROM PARK COMMUNITY SCHOOL FOR WINNING THE HAVANT ROTARY CLUB YOUTH SPEAKS TROPHY! 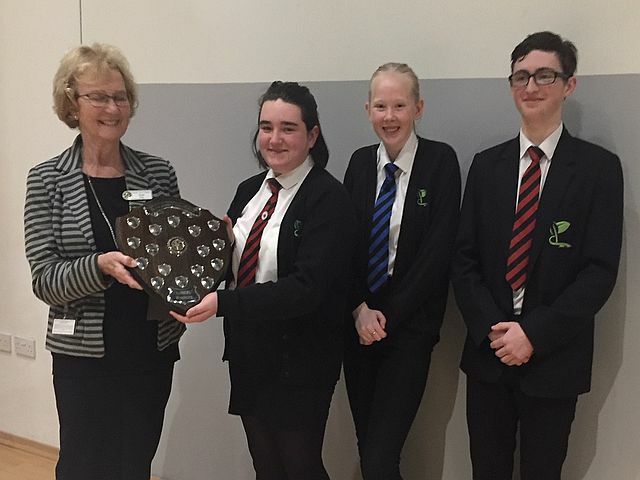 On Wednesday 30th January, six teams took part in the Club Round of the National Rotary Youth Speaks competition at Park Community School (PCS). Teams were entered from Crookhorn College, Havant Academy, Horndean Technical College and PCS. Each team, consisted of three students designated the chair, speaker and vote of thanks. Ten minutes were allowed for each team with marks being deducted for straying over time. The students spoke with great enthusiasm and conviction while displaying their factual knowledge and opinions about some really interesting and topical subjects which were, euthanasia, double standards, the death penalty, belief in God, social media and the existence of free will. Rotarian Ken Issac organised the event with the help of Rotarians Mike Sellis, John Blake and Don Kent. The judges, Canon Tom Kennar, Paul Clovell and Pam Richards commended all the students on their depth of research and their ability to expound on their chosen topic. The judges also provided their feedback on presentation, particularly helpful for Courtney Payne, Tyler Flint and Sam Browning who were the winning senior team from PCS and who go on to the next round of the senior competition. Also going through to the next round are the Horndean intermediate team.